-As you suddenly split in '91, I think we'd start from that period with a short sum. M) Well, we've got to step a little before, in 1990, during the recordings of our 3rd CD, "By Inheritance"; lots of journalists from all over the world had come to listen to what was coming out, and there was a strong pressure, because it was the 1st time we could avail ourselves with a superproducer like Flemming Rasmussen in the Sweet Silence studios in Copenhagen, where Metallica had recorded lucky "Ride the Lightning" and "Master of Puppets". Roadrunner had promised us many things, and everything seemed to go the right way; as a matter of fact, when the CD was out both the critics and the fans were enthusiastic, but for some unknown reason Roadrunner had forgotten what promised, so they didn't advertise the album, nor did they organize any tour, though our vocalist had showed them a list of clubs interested to make us play by them. Of course the Nth time that we had to face a no way out situation led us to the split, and each went his way; vocalist Flemming started to play in the bars and pubs for some money and a meal, and then he answered a paper ad for a Beatles' cover band, The Rubber Band, who was looking for someone able to play like John Lennon, and he immediately entered the band. I and Morten grew involved in a metal project called Missing Link, and I also led a metal radio show called Terror Squad. In '98 Danish indie Mighty Music decided to issue a sort of collection of 4 old demotapes of ours, recorded between '84 and '89 under the title "Deadly Relics", just to check the audience, and on August '98 they convinced us to play once in Copenhagen, joining the original line-up of the latest CD; the venue was overcrowded, and among them there were also some Diehard representants I already knew owing to the radio show; being surprised by the energy on the set, they asked us to record a reunion album, and we thought that a show is most different from a new album, but in the end the answer was yes, even if the rage for interrupting all so abruptly 8 years before had emerged again. Surprisingly when we were at the first studio session, we felt well at once. Our passion for metal had never ceased, it had just stayed asleep in our hearts, and during the recordings the adrenalin abundantly flooded. -How was the work relation with Anders Lundemark and Andy Sneap? M) The recordings at the Starstruckstudio in Copenhagen just took us 3 weeks, cos we felt at ease with the studio owner, Anders, who we already appreciated as a musician in Konkhra; we felt like a big family, cos we could go to him and record even at late night; he understood at once what kind of sounds we needed, we knew his potentialities and his studio, so here's why it went so fast. This time we've decided to avoid F.Rasmussen, cos he's a valid producer, but a bit old fashioned, and very expensive, too; he knows he has a big name in Denmark thanks to Metallica. After the recording, Andy Sneap just mixed; we chose him after hearing what he'd done with Testament, Exodus and Stuck Mojo; we wanted a wrapping '90's sound, without our music being changed. Moreover we also have to mention the studio session drummer Per M.Jensen, who already plays with Konkhra and Haunted; he's very busy, but he'll try to follow us live; he didn't write anything of "B.A.C.K. ", cos he arrived after all had been written; it was a very fast process, about a month. Besides Morten, who played the guitar and the bass in studio, is gonna play the guitar live, while the bass is gonna be duty of Danish death/thrash band Invocator's bass player; for the next shows and probably on our next CD the bass is gonna be played by Peter Torsland, who played in "By Inheritance", whereas the old drummer Carsten Nielsen who appeared on that album plays in a punk band now as a hobby. -Have you laready planned the dates of your next tour? M) Not yet, but we know we're playing at ROIKFKELTE ( hope the name is not so different in reality, it wasn't easy to catch it/n.o.a. ), a popular Danish metal festival; we also hope to take part in Dynamo and Wacken, but so far we've had no confirmation. We also discussed to make a European tour with Crimson Glory, but then it didn't happen anything, because there was scarce interest. As to the track-list, we'll play 3-4 songs from every album, so as to promote "B.A.C.K. ", but also make a great deal of the fans know our older tracks; as it's unlikely they'll be reissued, this is the only way to introduce them. With our new CD we've become modern, but not so much different from "By Inheritance"; it's like with Black Sabbath; when I listen to their old records I like them, though they sound a little retro, and now I hope they continue like this, I don't wish them to change their style radically. -So we have to thank Artillery and Lars Ulrich for the birth of thrash metal?
" and "M.O.P. ", and we also played some dates with Slayer, Destruction, and many others. M) It's true, it was a bizarre accident occurred in '89, when there was still the cold war; we took part in a Danish project called Next Stop to exchange culture between the East and the West of Europe, so we were organized a Russian tour along with the Danish punk legend band Sort Sol ( at that time SODS/n.o.a. ). We made some sold-out shows, and the local kids really went nuts; one night they came on the stage, covering us with handmade crosses and metal flags, till someone wrapped the Russian flag around my shoulders, which made the policemen very angry; they beat the kids and it was a complete chaos. Immediately later we were labelled as dangerous and unwished people, so we were forced to jump on a train and escorted to the border; it took us 5 days on the trans-Siberian railway, and it was just during that journey that we wrote "07:00 From Tashkent" and "Don't Believe". -What difficulties did you meet during the "B.A.C.K." songwriting? M) It was hard, and not planned; there are no melodic songs like "Don't Believe" on "By Inheritance". It wasn't our goal, it was just fast songs that came out, and some have been deeply modified from the original structure. It seems to me a mix between "Terror Squad" and "By Inheritance". The only thing that matters to us is to write catchy lines, the best possible ones. Now that we're followed by Diehard, so much better than the Inferno Management of 8 years ago, we're perfectly aware of the difficulties to promote an album like "B.A.CK. ", which is not Machine Head-oriented. Now the audience has split into those who listen to old bands and those who listen to brand-new bands; we apply to those who like an old fashioned style, but always fast. As to the lyrics, "Paparazzi" was written after Princess Diana's accident, "Final Show" is referred to when you cross the non-return point, which isn't necessarily death, while "How Do You Feel" talks about when you are subjected to an aesthetic surgeon operation, you wake up, look in the mirror, the doctor comes and asks the classical question: 'How do you feel now?'. 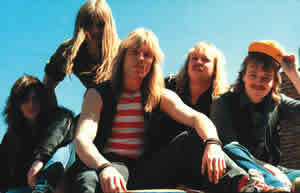 "Violent breed" was written by Flemming, but they're the only lyrics of which he's not satisfied; it's about a killer, and invites to think about the familiar, environmental, social, and economic causes that bring someone to become so, while in other conditions they might've got respected lawyers or engineers. "Cybermind" was born by Flemming's fears for the future; as he works a lot with computers, he often imagines a time where artificial minds rule the world, finally "Out of the Trash" is connected to the old "Back in the Trash", it's a kind of joke. The cover was realized by Eric Philipe, already author of Forbidden's, Channel Zero's, Stratovarious', Gamma Ray's and others' artworks. The Grim Reaper resuscitating in a polluted world and holding a phial in which a clean globe is contained, is connected to the title-track; it spurs to think about pollution the people who just care about the present; if we wanna save ourselves, we gotta do something now, we can't postpone the matter. It's a warning to awaken present generations' consciences. -Have you already forged new songs? M) So far we just have lots of ideas buzzing in our heads; we've recorded them and are working on. We have some interesting riffs, but no complete song; we haven't had much time to think about it and we're still waiting to see the reactions to "B.A.C.K." in the long term. However this time you won't have to wait 8 years for a new album, at the latest one year. We also wanna come and play in Italy; it's a fine place, and we could play with Rhapsody and Labyrinth.